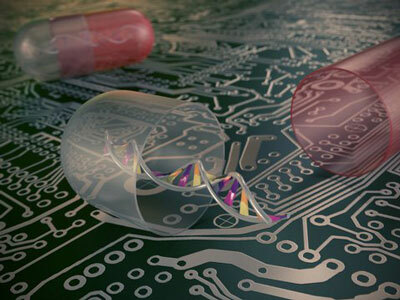 (Nanowerk News) Researchers at Eindhoven University of Technology (TU/e) present a new method that should enable controlled drug delivery into the bloodstream using DNA computers. In the journal Nature Communications ("Antibody-controlled actuation of DNA-based molecular circuits") the team, led by biomedical engineer Maarten Merkx, describes how it has developed the first DNA computer capable of detecting several antibodies in the blood and performing subsequent calculations based on this input. This is an important step towards the development of smart, 'intelligent' drugs that may allow better control of the medication for rheumatism and Crohn's disease, for example, with fewer side-effects and at lower cost. An analogy for the method presented by the TU/e researchers is a security system that opens the door depending on the person standing in front of it. If the camera recognizes the person, the door unlocks, but if the person is unknown, the door remains locked. "Research into diagnostic tests tends to focus on the 'recognition', but what is special about this system is that it can think and that it can be connected to actuation such as drug delivery," says professor of Biomedical Chemistry Maarten Merkx. To be able to perform such an action, 'intelligence' is needed, a role that is performed in this system by a DNA computer. DNA is best known as a carrier of genetic information, but DNA molecules are also highly suitable for performing molecular calculations. The sequence within a DNA molecule determines with which other DNA molecules it can react, which allows a researcher to program desired reaction circuits. To date biomedical applications of DNA computers have been limited because the input of DNA computers typically consists of other DNA and RNA molecules. To determine whether someone has a particular disease, it is essential to measure the concentration of specific antibodies - agents that our immune system produces when we are ill. Merkx and his colleagues are the first to have succeeded in linking the presence of antibodies to a DNA computer. Their method translates the presence of each antibody into a unique piece of DNA whereby the DNA computer can decide on the basis of the presence of one or more antibodies whether drug delivery, for example, is necessary. "The presence of a particular DNA molecule sets in motion a series of reactions whereby we can get the DNA computer to run various programs," explains PhD student and primary author Wouter Engelen. "Our results show that we can use the DNA computer to control the activity of enzymes, but we think it should also be possible to control the activity of a therapeutic antibody." In treating chronic diseases like rheumatism or Crohn's disease, such therapeutic antibodies are used as medication. One of the potential applications of this system is to measure the quantity of therapeutic antibodies in the blood and decide whether it is necessary to administer any extra medication. Merkx: "By directly linking the measurement of antibodies to the treatment of the disease, we may be able to prevent side-effects and reduce costs in the future."